No Nike rucksack. No TMNT pencil case. No “I Heart Your Mum” scrawled crudely across an exercise book. No crumpled timetable. No line for chips and coke at lunch. No wallsy at break. No hour of “là où est la piscine”, or two hours of trigonometry. 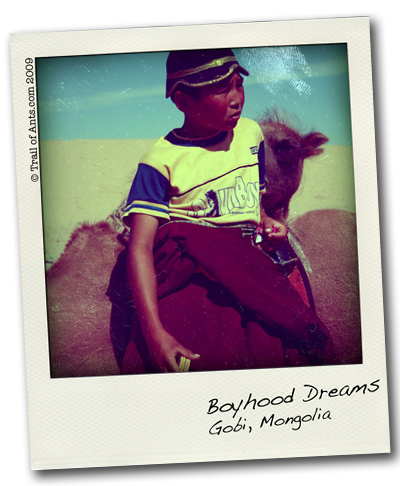 This weeks Reprint image is brought to you from the divine Mongolian Gobi. This young guy is leaning against his education, a camel. It’s his job to walk the tourist-toting camel around in a long, slow (ever so slightly boring) loop and back to the tourist-toting jeep. From what I remember (this shot is from July 2007) he asked for no money, and was a lot more endearing than the Reprint portrays him. His hand holds biscuits we were snacking on and his body is clothed in traditional threads. Mongolia remains one of the highlights of The Trail, for many reasons. It also remains one of the semi-regrets. I spent only two weeks there – one week at the Naadam and the following week bounding through the Gobi – and this was seriously too short. Mongolia is one of the least densely populated countries on the planet, with wide open spaces splattered with gers housing their charming, strong and resilient inhabitants – Chinggis Khaan’s people; the mighty Mongols. With these people in mind, I wouldn’t revisit for less than one month. Это с одной стороны хорошо, ведь есть что выбрать, а не берешь что дают.